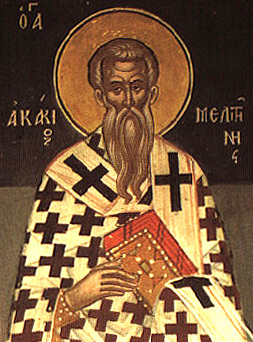 The Holy Martyr Akakios was brought to trial for belief in Christ. Three governors attempted to compel the holy martyr to offer sacrifice to idols, having subjected him to fierce tortures. Governor Licinius gave orders to rend the body of Saint Akakios with instruments of torture, and he then sent him to Governor Terence, who gave orders to throw Akakios into a cauldron, filled with boiling tar and tallow, but the martyr remained unharmed. Terence set off to the cities of Apameia and Apollonia and gave orders to bring the martyr after him. In one of these cities Saint Akakios was led into a pagan temple, but by his prayer all the idols there fell down. They beat the saint viciously and gave him over for devouring by beasts. When however they saw that he remained unharmed, they then threw him into a red-hot furnace. The martyr there also remained unharmed. The governor, wanting to check whether the furnace was sufficiently hot, went near it and himself burned. They then took the holy Martyr Akakios for torture to a certain Posidonius, who put heavy fetters on the holy martyr and gave orders to take him to the city of Miletos, but there also the saint by his prayer ruined idols. Finally, the exhausted torturers beheaded Saint Akakios (+ c. 321). A presbyter by the name of Leontios buried his body in the city of Synados (Asia Minor).